Its a double-cut mahogany body with a glued-in mahogany neck. The neck joint is of the long-tenon type which gives excellent neck/body coupling and contributes to a great tone and longer sustain. The body is bound in multi-ply (w/b/w/b/w/b/w if you must know) binding and the rosewood fingerboard is also bound in white. Moving up to the headstock, it’s also bound and – as well as the usual Epiphone shape – it features a big Gibson-style split-diamond inlay. A gold truss rod cover, engraved with Tak Matsumoto, matches the gold plated hardware down at the body end. As you’d expect, this comprises of a stop tailpiece and tunomatic bridge which look quite rich against the black-finished body. The pickups are a surprise. They’re US-made Gibson Burstbuckers. A Burstbucker 2 at the neck and a 3 at the bridge. They’re tied to individual volume controls and a master tone. The usual three-way toggle handles switching. Other nice touches are straplock buttons and some vintage-looking snot-green tuners. Very nice. The guitar ships with a Tak Matsumoto branded hard-case and a certificate of authenticity. 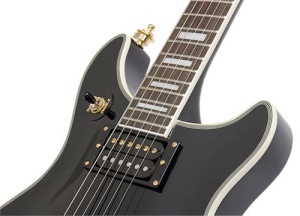 No word just yet on pricing but Epiphone tout an ‘affordable price point’.